Our Services Include: Roaches, Ants, Bees, Wasps - Mice & Rats - Wild Animal Trapping - Termites, Tent Fumigation, Lawn Spraying, Real Estate Termite Reports, and much more. specializes in termite extermination & a full range of pest control services. Owned and operated by Roy H. Hall with over 28 years of experience as a full service pest and termite control specialist. 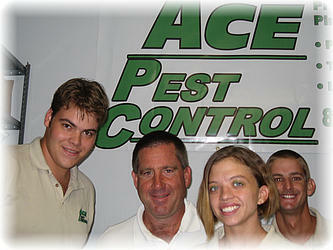 Ace Pest Control customize its services to meet our customer's specific needs. 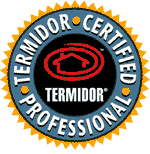 Our technicians receive ongoing training in the latest techniques to keep your home or business pest & termite free. All applications will be applied by trained technicians in company uniforms with photo I.D. badges and lettered company vehicles. Technicians attend ongoing training, as required by the Department of Agriculture & Consumer Services. Another great benefit of our pest control products is no longer do you need to be reminded that your home has been treated for pests by a lingering odor. We also offer tent-less drywood termite elimination. Safe and odorless, no need to leave your home during treatment, and fully guaranteed.